The Virginia football team opened the season with an impressive 42-13 win against Richmond last week. The Hoos got the job done behind a strong rushing attack with 333 yards and four touchdowns on the ground and stingy defense with two interceptions. Those two picks contributed to one storyline for the game. The Spiders came in with a highly productive receiver trio that figured to test the UVA secondary. Cortrelle Simpson (60 catches, 1,019 yards, 6 TDs), Dejon Brissett (63 catches, 896 yards, 7 TDs), and Tyler Wilkins (62 catches, 876 yards, 7 TDs) had combined for 2,791 yards and 20 touchdowns the previous year so slowing them down figured to be the top task for the Wahoo defense. Mission accomplished. Virginia allowed just 13 completions overall from three Richmond passers and kept the UR offense out of the end zone altogether. The three receivers caught eight passes for 151 yards with one play accounting for 54 yards of the total. That challenge, and the effort required to limit the receiving damage, served as a perfect tune-up for this week’s matchup with Indiana. The Hoosiers feature a three-headed threat and then some at receiver. Luke Timian (95 catches, 967 yards, 4 TDs), Nick Westbrook (65 catches, 1,097 yards, 7 TDs), Whop Philyor (35 catches, 362 yards, 3 TDs), and Donavan Hale 25 catches, 396 yards, 4 TDs) have combined for 220 receptions, 2,822 yards and 18 touchdowns so far in their careers. Timian finished third in the Big Ten with 68 receptions a year ago and he’s capable of a big game like his 13-catch, 91-yard, one-touchdown outing against Maryland last season. Westbrook led IU in 2016 with 995 yards and six touchdowns, but a torn ACL in the 2017 opener cut last season short. Hale also missed most of last season after getting injured in game three, but he led the team in the season opener with four catches for 60 yards and two scores. Hale scored against the Hoos last season. In other words, there’s a diverse set of receiving options for this Indiana offense so the secondary that’s expected to be a UVA strongsuit this season will be tested again. Are Bryce Hall, Juan Thornhill, and company up to the task again in week two? That’s one area to watch Saturday. Let’s look at some other keys for the game. UVA and Indiana are facing off in a rematch of last season’s 34-17 win by the Hoosiers. Redshirt freshman Peyton Ramsey helped swing the game in his team’s favor – along with IU’s special teams – when he checked in at quarterback. He finished with 173 yards passing with two touchdowns while completing 16 of 20 passes and added 32 yards rushing despite being sacked three times with a 26-yard touchdown. He caused defensive issues in particular with his scrambling ability. The Cavaliers admitted to being caught off guard with Ramsey’s entrance and having to adjust mid-game to the then redshirt freshman’s style. That won’t be the case this time around because Ramsey made his fifth career start last week in the 38-28 win at Florida International. He completed 20 of 27 passes for 156 yards and matched his career-high with three touchdown passes (true freshman Michael Penix Jr. played too and UVA should be prepared for him to enter at some point). Certainly, if the Hoos want to get a road victory, they need to do a better job against Ramsey. In addition to slowing down his receivers as mentioned in the intro, UVA’s defense must also make sure to contain any scrambles or designed runs for Ramsey. Keep in mind, Virginia spent the majority of last week’s opener in its nickel defense – a 2-4-5 alignment in this case – so that will be the scheme trying to deal with the offensive attack. Co-defensive coordinator Kelly Poppinga said that there are varying strategic things that can be done to sort of spy a scrambling quarterback, but that the nickel defense could help contain. Since defensive coordinator turned head coach Tom Allen joined the program in 2016, Indiana’s defense has shown significant improvement. The Hoosiers hang their collective hats on being disruptive, though, with a stated goal of three take-aways per game. They’ve hit that mark seven times in his tenure, including last week’s win at FIU. The poster child for the takeaway movement is senior safety Jonathan Crawford. He scored a pick-6 touchdown last week and has upped his career takeaway total to 13. That includes nine interceptions. He’s started 39 games in his career. What happens when you take away that ballhawking identity, though? The Cavaliers’ chances of winning go up if they can avoid turnovers. New starting quarterback Bryce Perkins threw a pick-6 INT last week and almost had another pass picked off. Virginia put the ball on the ground once, but didn’t lose the fumble (that’s a trend that carried forward from 2017). In the first road game of the season, protecting the football could be the most important key of all. It shouldn’t be surprising to see IU using the tight ends. Offensive coordinator Mike DeBord is in charge of that unit and that’s been his specialty unit throughout his career. He’s coached eight tight ends that have made the NFL. That included Thomas, who finished last season with five receiving touchdowns to tie for third in the Big Ten. By the way, one of Indiana’s touchdowns last week went to tight end Peyton Hendershot. Under Tom Allen in 2016 and 2017, Indiana’s run defense has landed in the middle of the pack nationally (53rd in 2016 and 61st in 2017 allowing approximately 160 yards per game). In 14 losses over those two seasons, however, many opponents have been able to run it on the Hoosiers – 10 of 14 have rushed for more than 150 yards and seven of 14 have cleared the 200-yard mark. 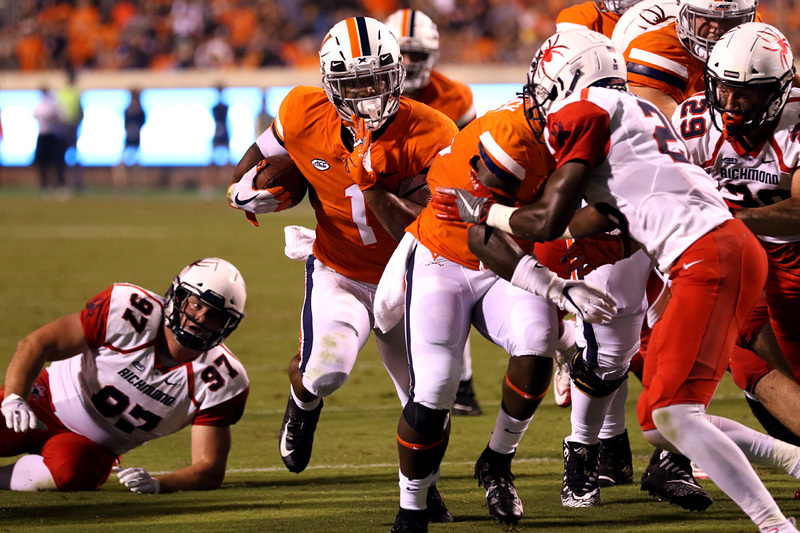 So the question for me is whether last week’s run success for UVA – 333 yards and 7.1 yards per carry – carries over this week or was it a bit of an FCS opponent mirage? FIU found some success last week (170 rushing yards/4.4 yards per carry) with similar plays to what’s in the Virginia playbook with Bryce Perkins at QB. I’m guessing that gets a lot of attention this week at IU practice along with some sort of containment scheme for Perkins. So it may be up to Jordan Ellis, Olamide Zaccheaus, PK Kier, and so forth to get the running game going. The true burden, of course, falls to the offensive line where UVA has shuffled names around throughout the preseason and in the opener due to injuries. If that unit can get some push, I like the Hoos’ chances. I don’t expect the same explosiveness and push this week, but I think the Hoos still gain some ground on the ground and win. VIRGINIA 31, INDIANA 24. Season to date: 1-0. Virginia lost to Indiana last season by 17. While Ramsey was impressive, UVA didn’t play well at all on offense or special teams and surrendered three big-play touchdowns. As Coach Mendenhall indicated when discussing the team’s mindset after Perkins’ pick-6 against Richmond last week, this team has a new standard. I don’t see Virginia playing that poorly. Plus, the Hoos will be ready for the dual-threat potential from each of IU’s quarterbacks. All of that being said, Indiana has quality playmakers on both sides of the ball and I expect this game to be a close one. It could go either way, but I think the defense and running game formula helps the Hoos escape Bloomington with a victory. VIRGINIA 21, INDIANA 17. Season to date: 1-0. It would be helpful is you told us each week who are the players that earned numbers for recognition and our roster for the game. Cassius Peat was removed but not Tyler Fannin.